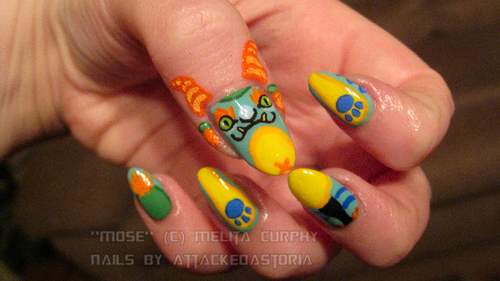 This manicure was inspired by the fantastic artist Melita Curphy, also known as Missmonster! I received that adorable plushie from her(his name is Momo! 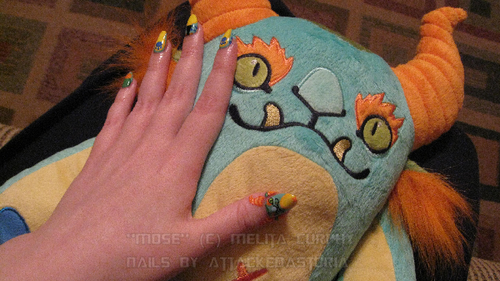 ), and I just had to do some cute nails to match him. Everyone got a kick out of these, and they were super fun to do. I was sad when I had to take them off. The base was China Glaze For Audrey, and all the rest was done in acrylic paint. You can check Missmonster out here for more of her amazing work and designs.